Amaranth leaves are washed and chopped up. They are then mixed with yogurt and spices. 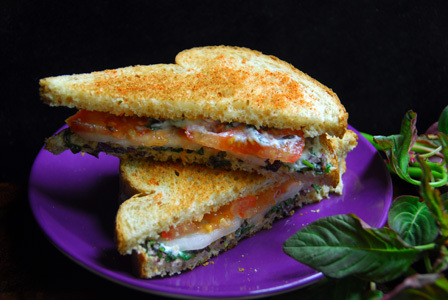 The mixture is spread on a toasted bread and layered with sliced onion and tomato. Serve amaranth leaves sandwich immediately. Makes: a Serving of Amaranth Leaves Sandwich. Mix together yogurt, amaranth leaves, green chiles and salt. 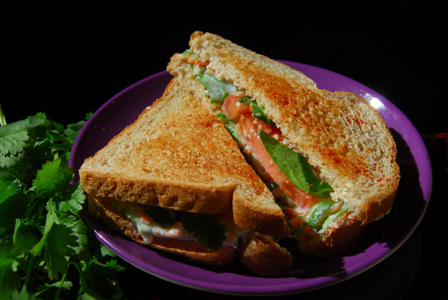 To prepare the sandwich, layer each bread slice with few spoons of prepared amaranth leaves yogurt mixture. Layer the sandwich with onion slices and tomato slices and sprinkle a pinch of salt on top. Cover with the other bread slice with amaranth yogurt mixture and cut the sandwich diagonally. Serve amaranth leaves sandwich immediately. Notes: Make sure not to leave the sandwich for long once prepared. Suggestions: Add more yogurt amaranth mixture depending on your preference. Variations: Avoid green chiles and add a pinch of black pepper powder instead to the yogurt. Other Names: Amaranth Leaves Sandwich.